In a little town in Ohio (pop. 690), there are hundreds of factory workers, several dozen farmers, three bar owners, three pastors, a convenience shop owner, several schoolteachers, a postmistress, and several firemen. While sustained by the local economy, workers are heavily dependent on a multi-town economy for shopping, banking, and other transactions. When a factory worker retires and a younger worker takes her place, the younger worker maintains that local economy. When a man starts up a new shop in town, he adds value. When the shop cannot sustain itself and closes, local opportunities to work, buy, and sell become more limited. But how does a worker decide what occupation to enter? Should Joe apply for work at the nearby factory, where barriers to entry are low? Should he try for a more competitive (and valued) career as a fireman or pastor? Should he move to a larger city where there are more employment opportunities (and more workers competing for them)? In the nearby town of Columbus (pop. 690,000),… well, I won’t even try for the numbers. Suffice to say, there are hundreds of representatives of hundreds of careers. When Jane approaches graduation at one of the many local universities, she also must decide what occupation to enter. But in a larger economy with more workers and more fluctuations in the labor market, it can be even more difficult to asses challenges and opportunities rationally. Which occupation would provide her with the most enjoyment, the most money, the highest chance of success – or the best combination of all three? Which fields are hiring? Which fields are firing? How does the Columbus economy and labor market tie into larger markets (like New York City) and smaller markets (like Milford Center)? This decision point is where I find many of my peers today. Even after they pick a career – electrical engineering, fashion design, architecture, graphic design – they often find it hard to actually enter the field after graduation. Over half of my friends are working retail, secretarial, sales, or other low-wage work outside of their field, even after graduating with honors in a beloved subject. There don’t seem to be good statistics available: how many students graduate with the degree? how many people are employed in the field locally? how many people are qualified but have yet to find an opening? how many applicants are there per opening locally? nationally? It is often hard to know the answers to these questions except through job-searching experience. For instance, Jane went to school in journalism and wants to edit a metropolitan paper. She interned at the Dispatch, but after graduation finds herself working at American Eagle. But many other OSU students are in a similar situation. 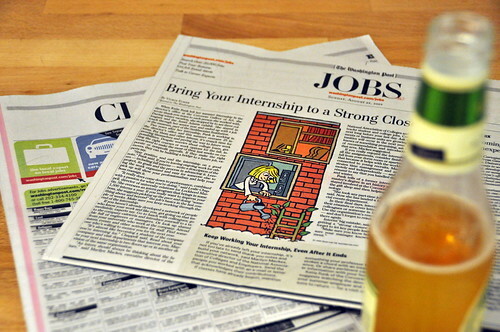 There are more entry-level journalists than there are open positions in the Columbus market. Jane is most likely to become a journalist if she leaves her friends and family behind and moves to a different city with fewer journalism majors. But if she values her relationships, she may find herself leaving her career behind and staying in Columbus… but not contributing to the local economy as much as she is capable of. This is where I see many of my peers, especially in the arts (as opposed to the sciences). They graduate from Ohio State with bright plans to work in their field, but soon encounter the reality of Columbus’ lack of entry-level jobs and glut of college-educated people. They end up in an available job unrelated to their career, or end up moving away from relationships and networks to try and find that career. If they stay, they are ashamed of their “failure” and cynical about their future prospects; if they go, they grow alienated from their friends and are weakened by the loss of the network they have cultivated up until graduation. So what sort of value can a worker add to a well-educated, midsize, corporately dominated town like Columbus? When there are so many people and so many careers (and a young person experiences so many feelings and hears so much contradictory advice from family and friends), how does a worker make a wise career choice? In the mobile, unstable, make-it-or-break-it, internationally-connected economy of today, what options do we have?